Lifeline AED's from Educational Medical Services & Safety Inc.
EMS & Safety is a local distributor for LifeLine Automated External Defibrillators (AED) and accessories. We will gladly come to your workplace for a free site assessment and determine what is will best suit your needs. Many other options are available. 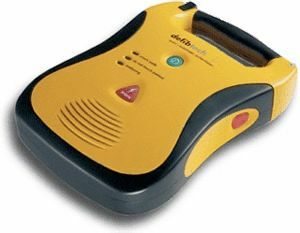 For first response professionals like; Police, Fire, and EMS, the Defibtech AED is standard equipment. For schools, offices, stores, factories, gyms, and public places, it’s becoming as vital as the fire extinguisher. The original award-winning Defibtech AED, the Lifeline includes all mission critical features necessary to provide the most advanced treatment for Sudden Cardiac Arrest. Tried and true. The first and only AED with a full-color interactive display that shows step-by-step videos for performing CPR, rescue breathing and external defibrillation. There’s nothing else like it.